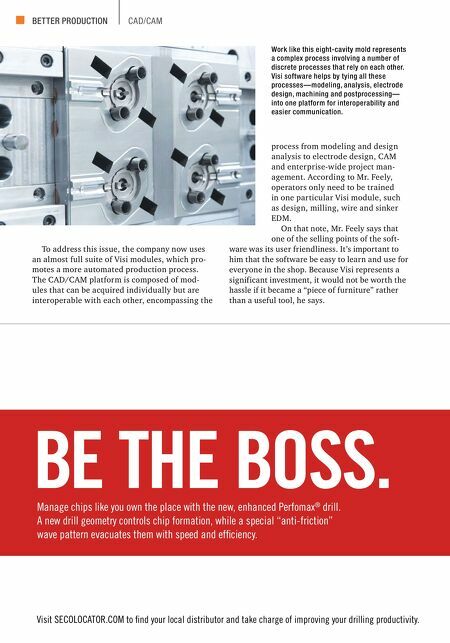 MMS MAY 2018 102 mmsonline.com BETTER PRODUCTION CAD/CAM To address this issue, the company now uses an almost full suite of Visi modules, which pro- motes a more automated production process. The CAD/CAM platform is composed of mod- ules that can be acquired individually but are interoperable with each other, encompassing the process from modeling and design analysis to electrode design, CAM and enterprise-wide project man- agement. According to Mr. Feely, operators only need to be trained in one particular Visi module, such as design, milling, wire and sinker EDM. On that note, Mr. Feely says that one of the selling points of the soft- ware was its user friendliness. It's important to him that the software be easy to learn and use for everyone in the shop. Because Visi represents a significant investment, it would not be worth the hassle if it became a "piece of furniture" rather than a useful tool, he says. BE THE BOSS. Manage chips like you own the place with the new, enhanced Perfomax ® drill. A new drill geometry controls chip formation, while a special "anti-friction" wave pattern evacuates them with speed and efficiency. Visit SECOLOCATOR.COM to find your local distributor and take charge of improving your drilling productivity. Work like this eight-cavity mold represents a complex process involving a number of discrete processes that rely on each other. 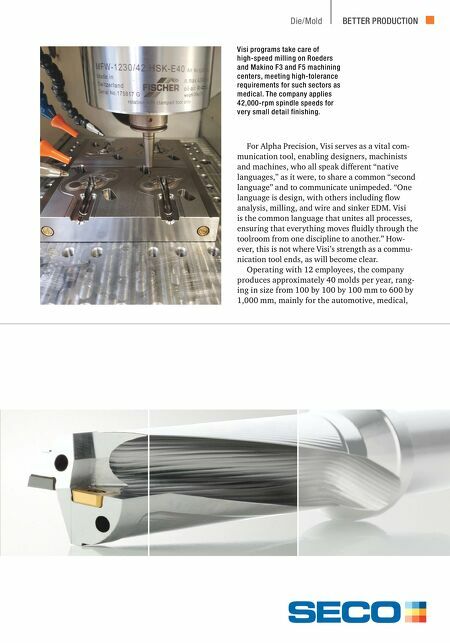 Visi software helps by tying all these processes—modeling, analysis, electrode design, machining and postprocessing— into one platform for interoperability and easier communication.